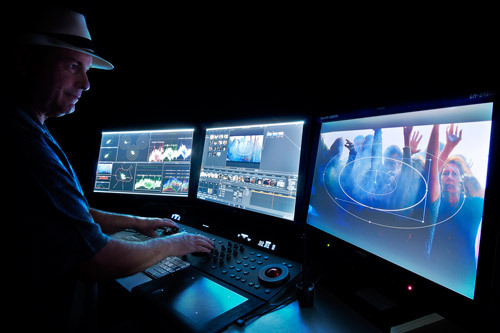 The color grading/editing suite is equipped with the power of the latest high-end MacPro, a professionally calibrated broadcast monitor specifically designed for color grading and a carefully controlled environment. The suite is designed to provide superior color perception via neutral gray wall coverings and indirect high- CRI bias lighting at the proper color temperature. This reel illustrates what is possible when using typical color grading techniques. This reel demonstrates the steps in a basic color grading assignment. The scene is from footage of a horror film in which the Director wanted to create a warm, soft beauty shot of a young woman enjoying a poignant moment before the inevitable apocalyptic ending. The grade was created first with primary corrections on the camera raw footage by expanding contrast and balancing color. Then, secondary corrections were added to focus the viewer’s eye on the young woman’s face, and to create the Director’s intended mood/look.